One thing my kids love about summer is having a chance to play with water balloons. On hot summer days when we need an easy game or activity to keep the kids busy, water balloons are the perfect boredom buster! Do you want to play with water balloons this summer? Look no further... Here are 15 Easy Water Balloon Game and Activity Ideas for Children! 1) Paint with Water Balloons - My kids and I have used balloons for painting and the results were absolutely beautiful. Our balloons were filled with air, but Megan from Littlest Bird Studio decided to use water balloons too. She said "The water added weight and movement to the balloons and were really fun to squish around!" 2) Water Balloon Number Target Practice - Combine number recognition review and water balloons for a fun, easy and educational summer game. Read more at Mom to 2 Posh Lil Divas. 3) Balloon Roll - For this game, you have to keep your water balloon on the ground. The child that rolls their water balloon the farthest, and does not pop it, wins! 4) Angry Bird Inspired Water Balloon Game - "Inspired by the mega popular video game Angry Birds this takes the game outside into the sun for fun all summer long." Read more at No Time for Flash Cards. 5) Water Balloon Sight Word Toss - It's really simple to help reinforce sight words while playing a water balloon toss game. Learn more at Royal Balloo. 6) Water Balloon Pinatas - Turn your monkey bars into a summer fun with this idea from Scrap Happy Heather. 7) How Far Can You Go? See who can throw their water balloon the farthest. The kid who gets their's the farthest WITHOUT POPPING it, wins! 8) Splash and Score Baseball - "Kids can test their aim and douse their opponent at the same time with this water balloon game of throwing and blocking skills." Get the scoop on the Spoonful website. 9) Water Balloon Spoon Races - Jessica from Two Shades of Pink used wooden spoons from the dollar store for this simple summer game. 10) Fill the Bucket - This is a great team game perfect for a kid's group or camp. Each team uses water balloons to fill up a bucket. Whichever team fills the bucket first wins! Read on about this game and others at My LDS Projects. Still looking for more easy water balloon activities? 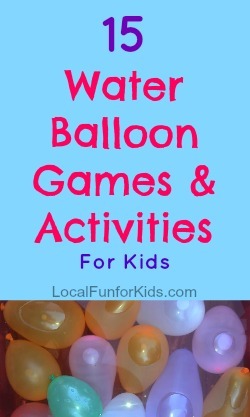 Read my post from last season with 5 more Water Balloon Games for Kids and Preschoolers. These are sure to keep the kids busy this summer! The largest water balloon fight consisted of 8,957 participants and was achieved by Christian Student Fellowship at the University of Kentucky in Lexington, on August 2011. 175,141 water balloons were used during the fight. Can you imagine that? Do you have any favorite water balloon games?